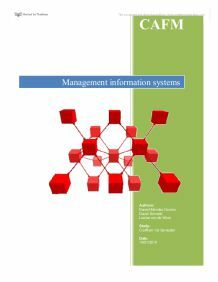 To understand what CAFM (Computer aided Facility Management) is it’s necessary to know what FM (Facility Management) is. This chapter will explain what FM is, what the responsibilities of a Facility Manager are and will show how a Facility Management department looks like inside a company. In both definitions we see that facility management is divided into 3 parts; place (housing), process (services) and technology (resources). 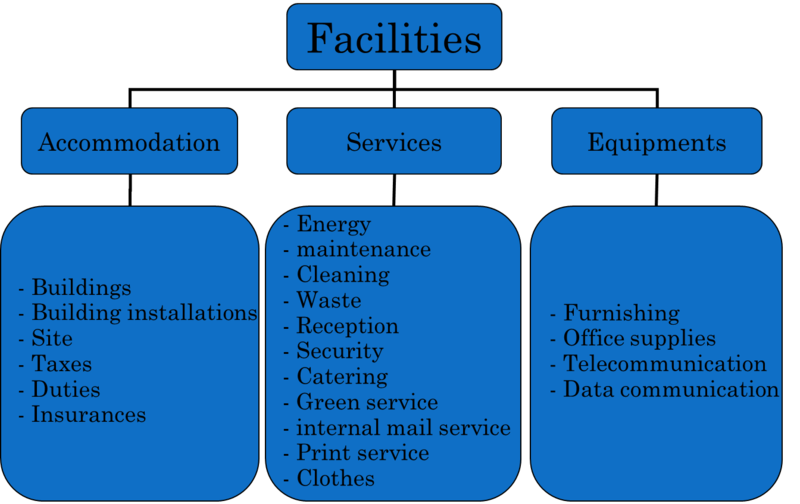 As we saw in the previous part, facility management is divided into 3 parts; Accommodation, services and equipment’s. To get an overview of all the responsibilities of the Facility Manager we made a schema. We divided the facilities management into the three parts and put all the responsibilities of the Facility Manager underneath it. It is the role of a Facility Manager to ensure that everything is available and operating properly for building occupants to do their work. The facility manager generally has the most influence upon the quality of life within a facility. The big advantages of vector graphics are that they can be scaled without loss of image quality and the much smaller file size per image. A special feature of data containment in CAFM systems is the possibility to link graphical and alphanumerical data. With that it is possible, that rooms and inventory is captured in the database and are at the same time connected to symbols and polygons in the drawing. With that feature a two-way access to the data is achieved. A simple click on a symbol is enough to retrieve information from the database and vice versa databank enquiries can be visualized in a graphic. The extend of those connections has to be assessed very critically since the work-load for inserting the data and data management is quite considerable and there is no guaranty that the links can be imported in a different system once it comes to a system change. Graphical and alphanumerical data form the so called stock data. Next to those a CAFM system also contains process data. Quality and quantity of the information captured in the start-up phase of the CAFM implementation has huge influence for perhaps centuries of facility management. Only if you posses current data about your real estate you truly got it under control. The acquisition of data is the first step to a successful setup of a CAFM system. Depending on the age of a building and the former management, two ways of gathering information are possible. To transform a pixel graphic into an intelligent and structured CAD format with layers it takes a sophisticated scanning program that is able to convert lines into vectors and indentifies circles, letters or even complex shapes like doors or walls which are of interest for a facility manager. If that is not possible because the bitmap is to poor in quality it can still be used to apply a hybrid procedure. 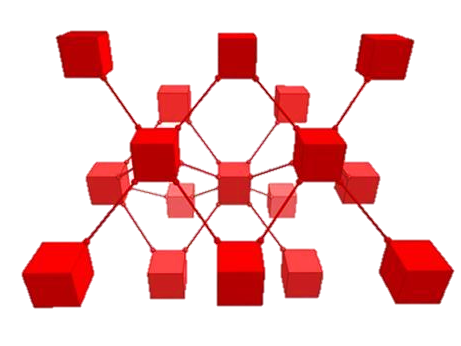 The image is then used as a background to lay polygons on top. The content of a database can be analyzed in various ways, depending on the needs of the users. 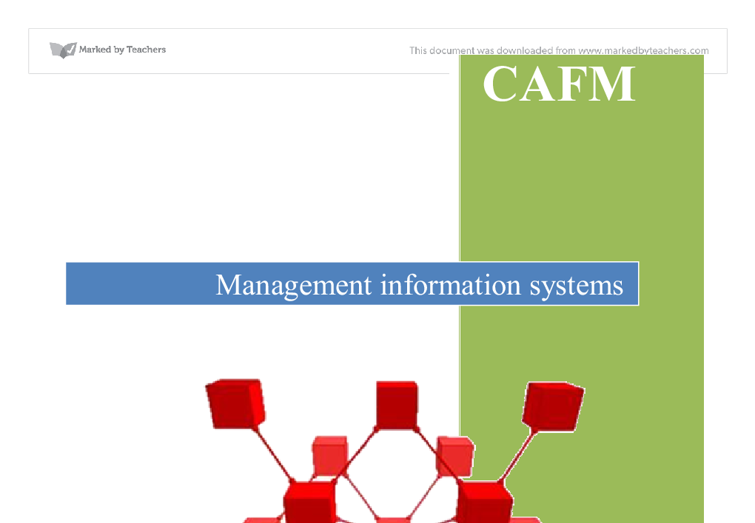 The CAFM concentrates all the information in one database so that it is not spread in parts inside the company. Everybody with the required log-in has access to the program at anytime. The CAFM helps planning into the future with providing the managers with KPI answers like maintenance costs per m2, facility costs per working space etc. So the managers have an overview of how the KPI´s are doing and can plan progress actions. To save time and money and to retrieve useful information out of the database the company must invest time and money in the program and keep the information complete and up to date. A CAFM costs a lot of money and will take some time to be completely implemented in a company. Once the program runs and every employee works properly with it, the entire company will benefit from it. This schema is made by ourselves but based on the definitions. Schema comes from the Dutch book: Het ondernemingsplan en de balanced scorecard. Business-to-Business [B2B] * Business-to-Consumer [B2C] * Business -to- Employee [B2E] As a customer of HSBC, the Business-to-Customer type of E-commerce will be evaluated. HSBC Bank PLC stands as the Vendor, their website, www.hsbc.co.uk stands as the host and Customers stands as the Buyer. 1.2 Background of the Problem Many of the organizations in Tanzania are not yet implement the issue of managing network operating system in their network system, but some of them started to use network operating system in their business environments example banks. Cisco Systems has grown over 20 years from its modest beginnings in California to a global giant with over 34,000 employees and a name that is recognized worldwide. Background A love story is intertwined with the birth of Cisco at Stanford University. 58) Nonaka and Takeuchi distinguish between explicit and tacit knowledge. Explicit knowledge is knowledge that "can be expressed in words and numbers, and easily communicated and shared in the form of hard data, scientific formulae, codified procedures, or universal principles." (Nonaka and Takeuchi 1995, p.
Scheduled Flight (FlightCode, StartingAirport, DestinationAirport, DepartureDate, DepartureTime, FlightDuration, AirportCode*, AirlineNo*) A Scheduled Flight has its information stored within an entity called "scheduled Flight" this comprises of many attributes such as a FlightCode,startingAirport, DestinationAirport, DepartureDate, DepartureTime, FlightDuration, AirportCode*, AirlineNo* 8.
admin, communication and public policy, IT and security, technial operations, HR and recruiting, growth and internationalization, platform and product marketing. They help the business at the start up and it also keeps track of various elements such as revenue recognition, inventory, purchasing etc. It also helps the user to give the insight and understanding of the business which would help make crucial decisions.